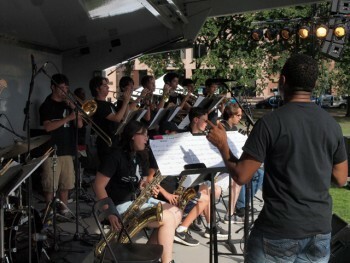 Youth bands from throughout the greater New Haven areas have always been featured at the New Haven Jazz Festivals. Dating back to the 2009 Festival, when four year olds and up took to the stage to recite poetry and dance, up to the present when local high school bands have been the lead performers, Jazz Haven has provided a platform for our youth to showcase their talent for the public. The 2015 festival will feature the “Jazz Haven All Star Youth Band,” a band of youngsters from the local New Haven area. Beginning at 6:00 p.m. they will take to the stage to kick off the 2015 New Haven Jazz Festival on the Green in downtown New Haven. Jazz Haven has a proud heritage of supporting and encouraging young people while providing them with a public venue attended by thousands.